I started the new generation of "Tuesdays with Dorie: Baking with Julia" with a shortfall. I was on the road and didn't plan ahead, so I missed the first recipe of a long, long list of recipes to come. But I love bread baking, therefore I will for sure catch up with the White Loafs! But let's talk about this week. The new rules for TWD include we only do two recipes a month, an easier one and one that is more difficult. The Chocolate Truffle Tartlets are for sure on the more difficult, at least more time-consuming, side. I am not a huge fan of tarte-baking - not that I don't like them, au contraire! But I am the biggest looser in tart shell baking. This dough recipe took me a long, long time do do (I did freeze it a bit longer, shaved it and pressed the curls in the form. Time consuming, but easy!) And in the end it is the first tarte dough I managed not to burn or ruin in another way. - I like! The filling sounds more than decadent - and meets the expectations also in taste! I had to do some changes: Instead of Cantuccini I used milk-nut chocolate and sesame brittle because that was what I had at hand. I made one big tarte instead of 6 tartlets, because I don't posess 6 tartlet forms. I don't think it made a big difference. I increased baking time to about 20 mins. Maybe I should have added a bit more, because the filling was very, very moisty, almost liquid. But oh so good!! 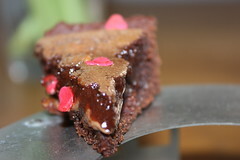 Think Mousse au chocolat made of theree different chocolates with crunchy pieces in tarte. Mhhhh! I chilled it and brought it to my office the next day. The texture was different, more chewy, but again more than yummi! It was really worth all the fuzz I had with the tart shell! You may find the recipe on pages 382-383 in "Baking with Julia" or on the pages of this weeks hostesses: Steph, Spike, Jaime and Jessica. 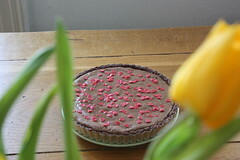 I love the little hearts on the top of your tart! Glad you were able to make this this week. You will have to catch up with the white loaves, they were delicious as well! Wow, all that effort really shows! The little hearts are a nice touch! It looks like you did very well! 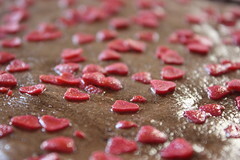 The heart sprinkles were very festive!